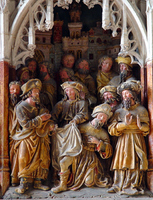 Painted screen sculpture in the niches in the south transept, depicting Philetus being released from Hermogenes' spell -- from The Golden Legend. James the Great and the Conversion of Hermogenes the Sorcerer, from Art in the Christian Tradition, a project of the Vanderbilt Divinity Library, Nashville, TN. http://diglib.library.vanderbilt.edu/act-imagelink.pl?RC=29341 [retrieved April 24, 2019]. Chorschranke der Kathedrale von Amiens. Knipping, Detlef. Munchen: Deutscher Kunstverlag, 2001.